The mahogany console table was completed on deadline. The table was initially oiled to bring out the beauty of its grain and the natural richness of color. Then the console was sprayed with catalyzed lacquer for a hand-rubbed look to the finish. Note the detailing of the turned legs and the dovetail jointery of the drawers. Landers' Studio continued to add the detailing to the mahogany sofa table. We added a cockbeading to the curved sides and to the drawer fronts. The drawers were then fitted to the carcase. In this project, we are not using drawer hardware. The drawers will slide easily wood-on-wood. We began the finishing process with a natural oil conditioner that deepens and richens the natural mahogany wood color. 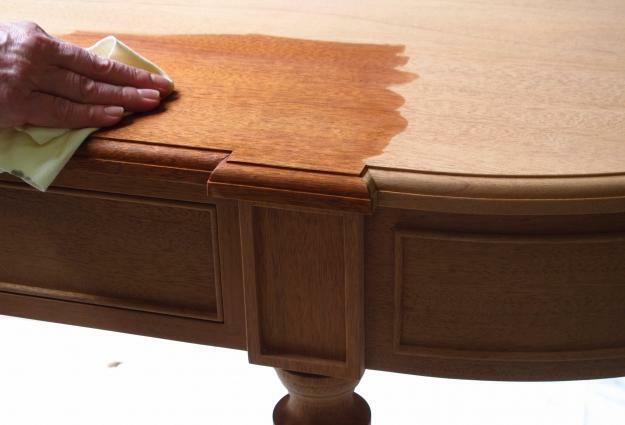 After this oil dries for 24 hours, we began the spray lacquer process for a hand-rubbed finish. 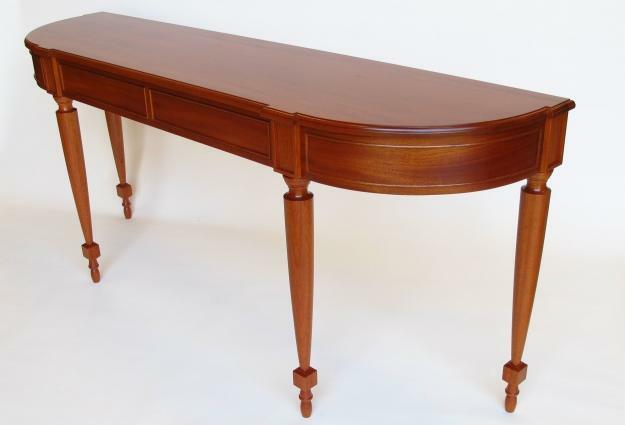 Landers' Studio was commissioned to produce a mahogany sofa table in a very compressed amount of time. We quickly procured the clear, genuine Mahogany for the project. The thick chunk of mahogany was cut into pieces for the four turned legs. We also had to cut some of the mahogany into thin strips which were then laminated and bent to form the curved rails. In 2007, St. Austin Catholic Parish was anticipating the celebration of its 100th anniversary of its founding in 1908. 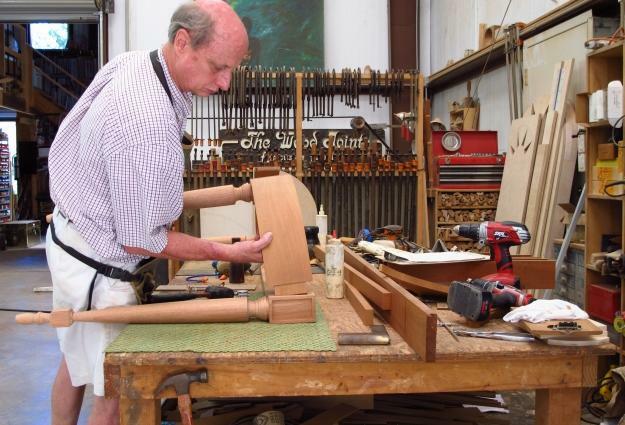 When the parish approached Mark about creating new liturgical furniture for the church, Mark wanted to be sure that they were not just turning to him because he and his family had been parishioners since the early 1980s. 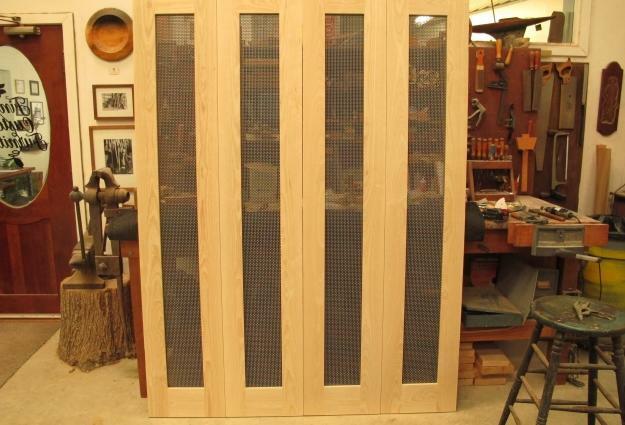 He encouraged the parish to contact and get design proposals and bids from other woodworkers in the Guild of Austin Artisans that Mark belongs to along with several other skilled wood craftsmen . The church committee had mentioned to Mark that they had saved the brass gate and marble from the old communion railing that had been removed many years ago. Mark went down to the dusty storage area to examine these elements and determine how to work these into his final design proposals. The committee ultimately decided on Landers’ Studio as their choice to build the new church furniture primarily because he was the only one that incorporated these essential elements as well as reflecting many existing architectural elements in his final design proposals. All of the furniture would be built out of white oak and stained to match the stain of the existing oak columns of the sanctuary. The oak lumber was totally in the “rough” before being transformed into the altar and ambo. 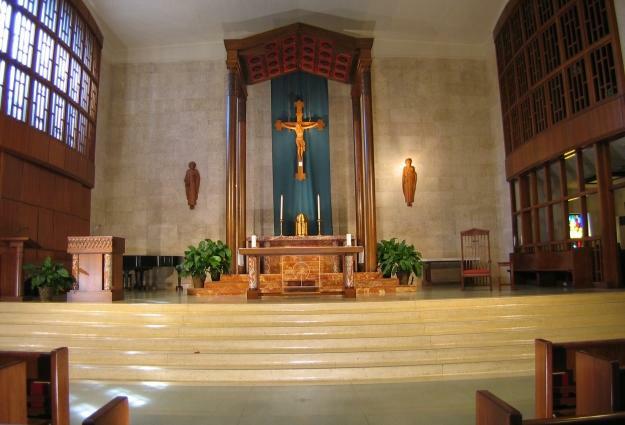 The altar with the brass omega symbol and the marble columns match the existing marble and wood so well that many people now do not realize that this altar was not original to the church. Landers used fifteen parishioners to help move and assemble the 700 lb. altar. Once in place, a concealed caster system allows one person to easily move the altar for different liturgies. The ambo not only incorporated the marble columns, but Mark also picked up the Celtic braid carving design from the columns of the baldachino for the crest rail of the ambo (or pulpit). The credence table and the cantor stand base also imitate the existing wood columns on a smaller scale. The pediment of the baldachino is reflected in the back of the presider’s chair with the chair’s side panels echoing the crossbar patterns on the screens of the sanctuary. The middle cross pattern was done in rosewood to stand out from the stained oak of the rest of the ergonomically designed presider's chair. A client approached us about a year ago wanting a bar and back bar for a veritable man-cave he was adding to his residence. His initial concept had grown from his original idea of just adding a garage for his classic car collection when his wife asked that he also include an exercise room for her. With his addition being on a cliffside, he thought he might add a 1,600 sq. ft. recreational room below. His first purchase for this room was a 1890’s Victorian style pool table. Originally, he talked to us about creating a bar to complement this Victorian design. But he had leanings toward Art Deco and his love for the elevator doors from the Chrysler Building in New York ultimately drove the design of the bar. We collaborated with the client’s designer, Etty Brish, who envisioned and then actualized the room’s décor. We chose veneers of birdseye maple, tamo ash, exquisite walnut burl, bubinga and ebony to lay out the Art Deco design for the front of the bar. This big of a project called for a BIG board. Wanting a continuous board for both the bar top and the back bar top, we selected a 55-inch wide by 19-foot long board of bubinga from an importer in Pennsylvania. The almost 600 lb. board was shipped to a friend’s shop where we would have the space to maneuver the board around. The board was cut in half along the length and edges were folded along the length for the rounded edges of the bar tops. After the finish work on the veneer bar front and the combination of the curved bubinga panels and wenge beads to create walls and doors, we were ready for the first phase of installation. The assembly process began and at last the first phase was complete. In the work area behind the bar, the cabinets for the glassware and stemware have doors that are made of the same curved bubinga and wenge. Even the small refrigerator’s stainless steel door was replaced with a bubinga & wenge door front. A small wooly mammoth ivory dot in the upper corner of a door marks the spot for opening with a simple touch. The final phase of installation was of a curtain effect of the bubinga & wenge panels to tie the back bar in with the back wall. The curtain effect and the wenge frame leave one expecting a movie projector to start a show at any time. 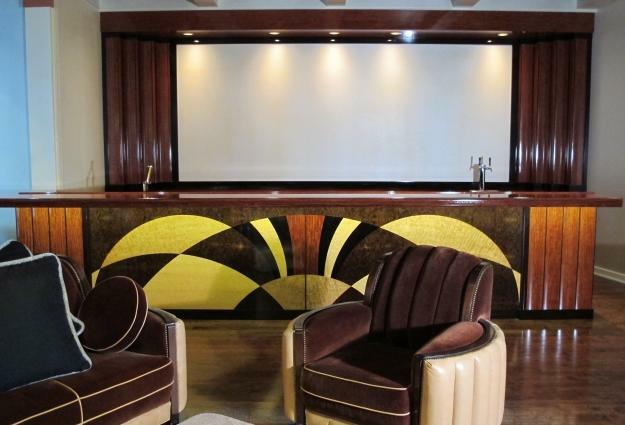 The owner is commissioning an Art Deco mural painted in this space speculating that a stylized Austin skyline with perhaps a whimsically added Chrysler Building would be an appropriate tip of the hat to the bar’s inspiration. At Landers’ Studio, we have designed and built custom furniture and produced high-quality architectural millwork since 1975. Our creations satisfy the desire for artistry as well as the necessity of function. With so many years of proven experience, our clients can rely on us being there when they come back years later to add to their furnishings. We do only individual commissions. We have no product-line as such, but rather fill the void between what people really want and what is now commercially available. We are accustomed to working with designers, builders, or the end-users directly in all phases of design. We use only the highest quality materials and the finest joinery. We are skilled in such woodworking techniques as carving, entarsia, marquetry, steambending and lathework. Our scope of work ranges from sculpture to mantels, front doors to period reproductions, from gingerbread to the most contemporary furniture. In restorations, we can reproduce carved newell posts and match existing balusters, porch columns, bullseyes and plinth blocks. We also work with other artists whose skills in stained glass, bronze casting and upholstery complement our work. We look forward to the opportunity to bid your future projects and hopefully have the pleasure of working with you.